Hello, loyal reader! We here at Ridgefood have been digitally leading you around Queens’s most accessible polslavomexidoreanese neighborhood for a while, but now it’s time for us to give you the opportunity to follow us around in person! That’s right: We’re giving a tour. And not just any tour, but a RIDGEFOOD GROCERY SHOPPING TOUR. Have you always wanted to go into that Arab bodega and buy the groceries in the back, but you’re not sure how to use them? Do you need a step-by-step introduction to the glorious wonder that is Parrot Coffee? Do you know which fruit stand sells pristine Halal meat in the back? Are you confused about which Polish drink syrup to buy? Do you want to walk around the ‘hood, talk history and recipes, and eat sausage sticks from Morscher’s with the ladies of your neighborhood food blog on a sunny summer day? 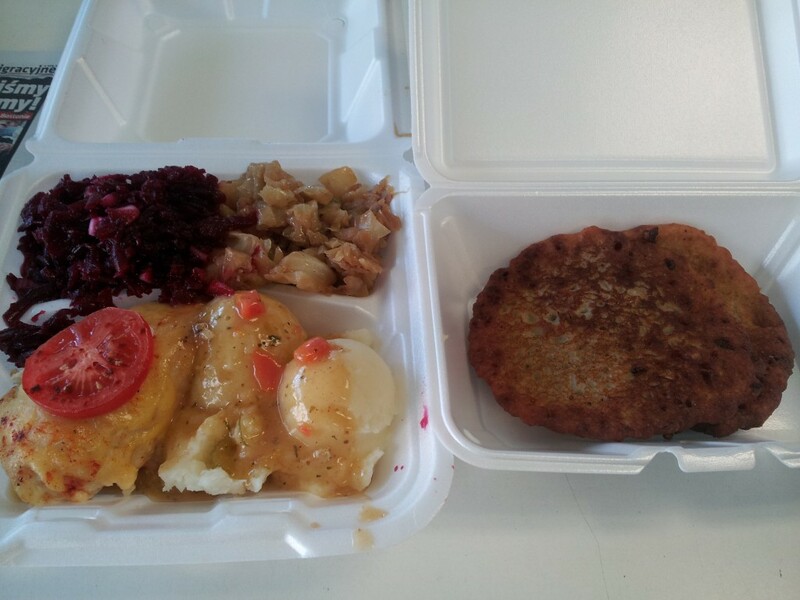 Stuffed bass and fixins from Aneta Deli. Also pictured: potato pancakes ($1 each when they have ’em). A typical low-key sunny day for us involves a trip to Rosemary’s Playground and a food stop somewhere nearby. Aneta Deli, situated a block from the playground on Woodward and Palmetto, stands out among Ridgewood’s Polish steam-table joints for a few reasons.